SAN FRANCISCO — The 29th Japanese New Year’s bell-ringing ceremony will be held in Samsung Hall at the Asian Art Museum, 200 Larkin St., on Wednesday, Dec. 31. Doors open at 9:30 a.m. for members, 11:30 a.m. for regular visitors. 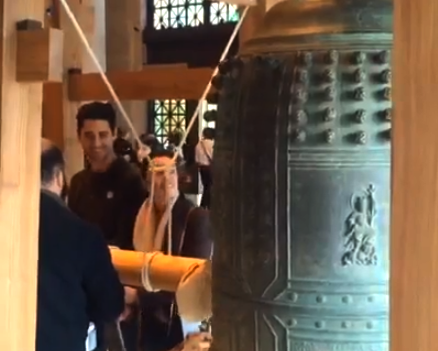 In this contemplative and festive ceremony, participants can strike the museum’s 2,100-lb., 16th-century Japanese bronze bell to herald the start of a fresh new year. Led by Rev. Gengo Akiba with opening remarks about the Japanese New Year by Yoshie Akiba (founder and namesake of Yoshi’s Jazz Club), the ceremony includes a purification ritual and chanting of the Buddhist Heart Sutra. Rev. Akiba begins the bell-ringing, and participants take turns ringing the bronze bell to leave behind any negative experiences, wrong deeds and ill luck of the previous year. There will also be workshops and activities for families. On Saturday, Jan. 10, from 12 to 1 p.m. in Samsung Hall, celebrate the Japanese New Year with Kagami Kai, an acclaimed mochitsuki group, as it presents the colorful and exciting New Year’s tradition of mochi-pounding to make delectably sweet rice cakes, with music, dance and costumes. Sponsored by the Henri and Tomoye Takahashi Charitable Foundation. Free with museum admission. First come, first served. Pick up tickets to ring the bell at the admission desk. Admission is $15 general, $10 for seniors, university students and youths (13-17), and free for children under 12. Hours are 10 a.m. to 5 p.m. Tuesday through Sunday; closed Mondays and Christmas Day. For more information, visit www.asianart.org.